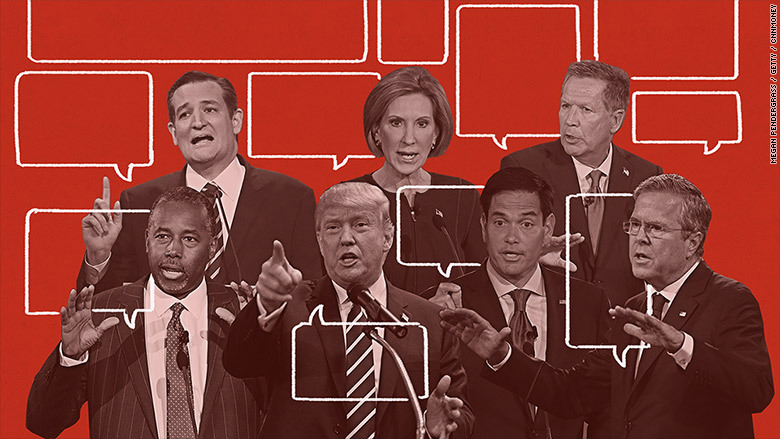 At the debate on Tuesday night, you'll hear the Republican candidates make all sorts of claims. They'll likely talk about Social Security, the national debt, Obamacare and poverty. Some of the points will be accurate. Others will not be. Here are the facts on the biggest economic issues. False: Starting in 2034 -- 19 years from now -- Social Security will no longer have enough revenue coming in to pay 100% of promised benefits to retirees. But it will still be able to pay 79% of those promised benefits. That's according to estimates from the program's trustees, which assume no reforms are made. True. The typical American family income was $53,657 in 2014, barely changed from $54,462 a year earlier, according to the U.S. Census Bureau. Median income remains lower than it was in 2007 and is far below its peak set in 1999. Mostly false: Waste, fraud and abuse may be inexcusable, but it's not what's driving the country's debt. For instance, improper payments in Medicare and Medicaid is an estimated $89 billion a year. Best efforts to recapture that money likely wouldn't net more than $10 billion, according to the Committee for a Responsible Federal Budget. That's $100 billion over a decade -- a lot of money, but less than half of the country's annual interest payments on the debt. As for other ideas on how Republicans would cut spending, popular targets include the Department of Education and the Environmental Protection Agency, as well as Planned Parenthood. But spending on those three areas combined is less than 3% of annual government spending. By contrast, the big entitlement programs (Medicare, Medicaid and Social Security) account for more than half. True: Only 62.4% of Americans are employed or looking for a job, the lowest since 1977. The Republicans are trying to pin the blame on President Obama, but the decline predated him. Why is this happening? Part of it is that America's workforce is aging and the Baby Boomers are retiring. It is also declining because women are leaving the workforce to care for their children, and men are dropping out in large part because they can't find positions that pay decently or they don't have the education and skills to land employment. Finally, the U.S. has a sizable number of working-age folks out on disability with chronic health conditions. Not likely: Several candidates, including Donald Trump, Jeb Bush and Chris Christie, say they can rev up the U.S. economy. Bush and Christie have gotten more specific, claiming they can grow it by 4% a year. On the face of it, 4% might not seem that outlandish. But it's actually a huge number. To find a period when the U.S. routinely grew at that pace, you have to go as far back as the 1950s and 1960s. More recently, the economy grew at 4% in 2000, right before the dot-com bubble burst. Lately, the economy has been expanding at just over 2% a year. It depends: Premiums will increase an average of 7.5% for the benchmark silver insurance plan next year in the 37 states using the federal Obamacare exchange. The largest increase among the 37 states was in Oklahoma, where the benchmark plan's premium rose by an average of 36%. Other states with premium increases of more than 25% were Alaska, Montana and New Mexico. True: The number of Americans in poverty has risen by 6.9 million during Obama's presidency, jumping to 46.7 million people last year. Obama's first term also coincided with very turbulent economic times. When Obama was elected, the share of people in poverty was 13.2%. It jumped to 15.1% in 2010, but has since fallen back to 14.8%. True. As a share of the economy, debt held by the public (which excludes money owed to government programs such as Social Security) has almost doubled, rising from 39% of GDP to 75% during President Obama's tenure. Gross debt (which includes money owed to government programs) is now about $18.5 trillion, up 52% as a share of GDP in the past eight years. At the same, the annual deficit has come way down. It ballooned during Obama's first year, due to a mix of tax cuts, social safety net spending and other stimulus programs after the financial crisis. But every year since, it has fallen thanks to an improved economy and spending cuts. At 2.5% of GDP, the deficit is now at its lowest level since 2007 and is below the 50-year average, according to the Congressional Budget Office. Nevertheless, the deficit is expected to start growing again by 2018 due largely to costs associated with the retirement of the Baby Boomers. Barring any policy changes, the CBO projects the country's debt will go "up sharply relative to GDP" after 2025. False: Only 4% of employers with at least 50 full-time workers said they shifted some staffers from full-time to part-time schedules so that they wouldn't qualify for health care. And another 4% said they were reducing the number of full-time employees they planned to hire because of the cost of health benefits.